Cryptopay FAQ: how to buy bitcoins? what is crypto card? etc - How do I confirm a new device ID? All Categories › User account and Security › How do I confirm a new device ID? A device ID (device identification) is a distinctive number associated with a laptop, smartphone or a similar electronic device. 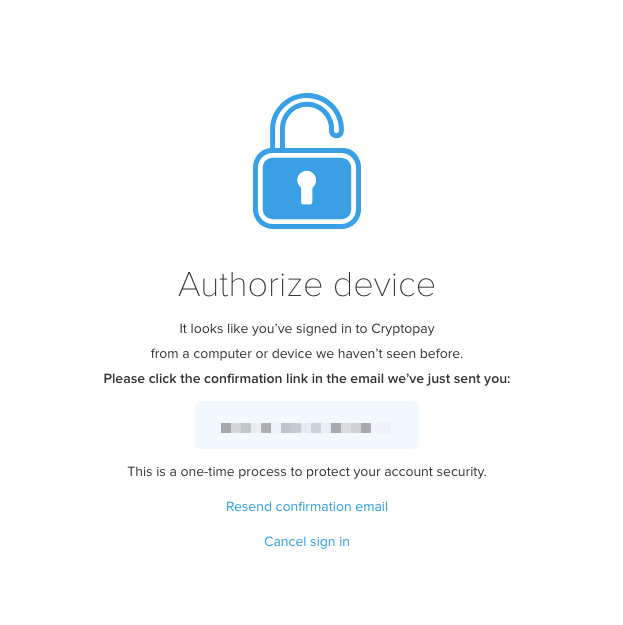 As an additional security measure, Cryptopay customers are now required to confirm every new device they use. It means that when you log in from another PC, laptop, tablet or phone or use browser's incognito or private browsing modes you will be shown an Authorize device screen and an email will be sent to your mailbox. You will need to click the confirmation button to get to your account. If you haven't received a confirmation email after 20 minutes, please try resending it using a Resend confirmation email button or check your Spam folder. If there is no email in your Spam folder, please contact Cryptopay customer support or send a request to support@cryptopay.me.